Oops, posted this in the general demos and projects forum.. I've been developing this game over the past few months.... It's been Alpha tested and I think it is now ready for Beta testing...! Its been developed using Basic4Android, which creates the WebView for the game and the Menus. The rest is HTML5, using BabylonJS and JS to create the gameplay mechanics. any online playable demo to test ? I can make this available - at the moment it's "only" available for Internal Test on Google Play at the moment. I can add you to the list - if you PM me a gmail email account you can then download and install the game as it stands at the moment - it's only Alpha test right now. This is now available on Open Beta... So there are still some items to be addressed, but hopefully not too many. It's my first attempt at a game ever! Left hand side of screen moves the players' ship. The right hand side fires a shot. I looked up the app in the Play store and found it under 'beta' versions. Jeey! Installed the Android app and it plays nicely. 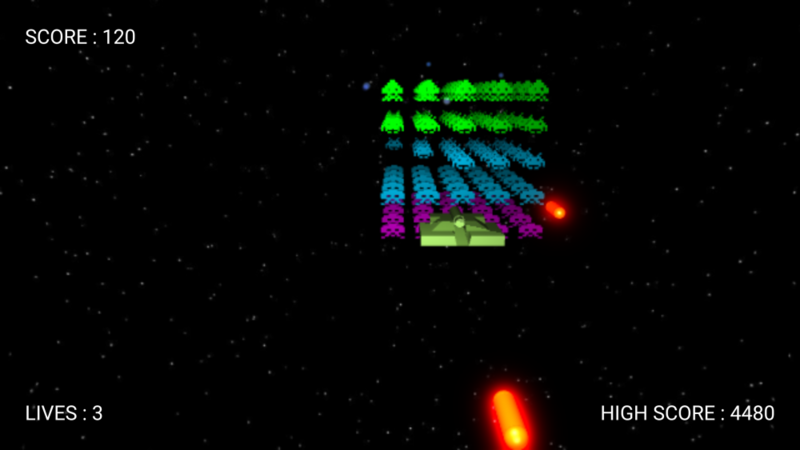 The theme for space invaders is very intuitive; the game objective doesn't need much explanation for this retro classic. In the (?) help screen you maybe want to put the instructions on movement and firing. When I tap too frequently on the screen, my device gets into zoom mode and then I only see 1/4th of the screen (star field). The shooting sound is a bit annoying for other people in the room. But these are just minor annoyances between me and my phone haha. Cheers, thanks for installing it and giving it a go. It is Beta - it only just moved out of Alpha test. I'm interested to know how you managed to tap too frequently - this shouldn't happen within the App itself as everything is locked, including the webview used. Are you able to confirm the device and Android version you have please? Yes - the sound should be switched off using the cog icon... That's still to do! Cheers, thanks for confirming - I'll check to see what I can do with that.... Probably nothing to be honest as it sits 'on top' of the Apps I guess.